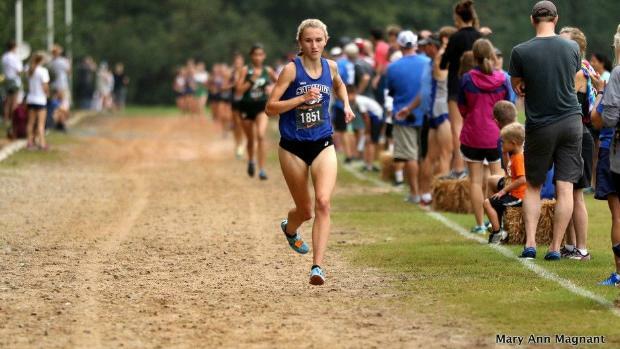 Returning once again to the WakeMed Course at the Great American Cross Country Festival in North Carolina, Kelsey Chmiel (Saratoga Springs) moved one more step up the ladder on the All-Time list. Chmiel ran to the overall win by nearly 45seconds, winning the race in 16:43.8. That marks drops Chmiel's time from her win last year, down by about 7 seconds, and pushes her past Ryen Frazier (Ravenscroft, NC) to #3 All-Time on the course. The only athletes ahead of her are Aisling Cuffe (Cornwall), who has the meet record at 16:40.9, and Nevada Mareno (Leesville Road, NC) with the course record from her run at NXN-SE. Chmiel, who mentions that she wasn't 100% for the race, will return home to New York, to tackle the SPAC course. Her team, which took second overall at the meet, will now be in a month long battle with fellow Section 2 rivals Niskayuna and Shenendehowa, who will all be competing for a Sectional Title. Chmiel had previously run at Great Meadow in Virginia in late August, where she garnered a 162 Speed Rating. That kind of effort could have put serious challenge to the current course record, as well as lowering her own course record at SPAC.